Year of the Labbit: Shhhh! It's a library! It's been a pretty adventurous trip in Seattle so far. Pipkin never anticipated facing bicycle eating cephalopods, giant spiders or face hugging aliens, and he's sure there are more freaks to follow. Domo's already expressed excitement over a giant troll who lives under the Fremont bridge. 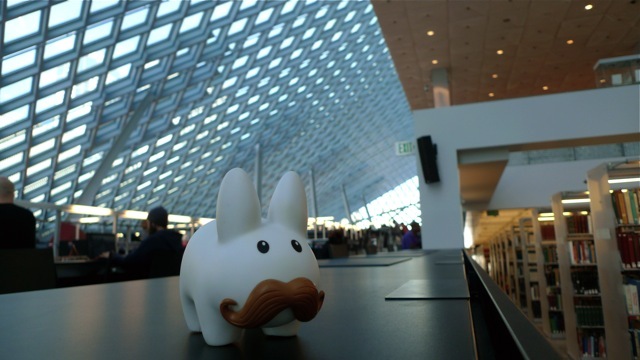 For now, Pipkin is content to spend some quiet time at the Seattle Central Library downtown. This 11 storey, glass and metal structure looked like a giant stack of books to Pipkin, at least from the outside. 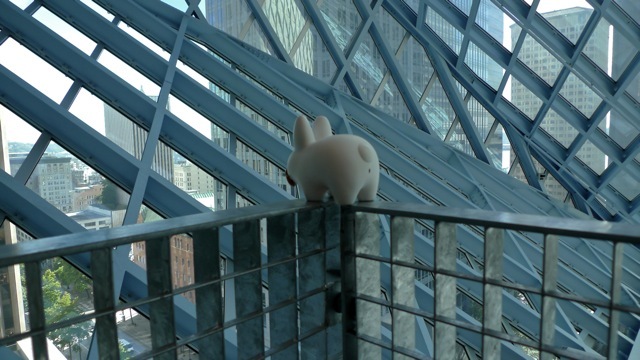 On the inside, on the top floor, Pipkin enjoyed a view of downtown Seattle. What Pipkin likes best about the library is its clever display of the non-fiction section. A long, gentle footpath spirals upwards through the center of the library, allowing visitors to peruse the books uninterrupted. The books are displayed in order of the Dewey Decimal System, with 9 floors dedicated to each of the 100s, 200s, 300s grouping and so on through the 900s. It was nice for Pipkin to hop up the ramp instead of getting trampled by kids running on the brightly lit escalators. 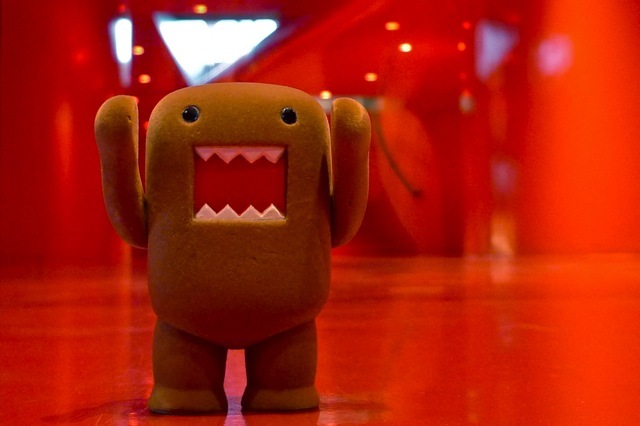 Looks like Domo found himself at home at the library, too. 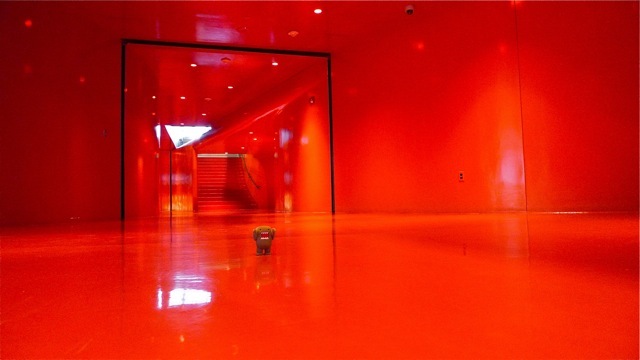 On the fourth floor there are restrooms, meeting rooms, classrooms and an administrative office. The hallway connecting all these rooms is a smooth, curving, hallway all in bright red, which starkly contrasts the soft blues and cool metal tones in the rest of the library. To read more about the history and design of the Seattle Central Library, visit the wikipedia page or the Seattle Library's website, which also lists ongoing special events. If you visit the library, make sure you get a visitor's map on the first or third floor, and take the guided walking tour of the library. It's a great place to visit, and a quiet break from the city. Pipkin shouldn't worry too much about the troll. He's big and looks fierce, but he's really quite gentle. And he doesn't live too far from Molly Moo's ice cream in Wallingford either. 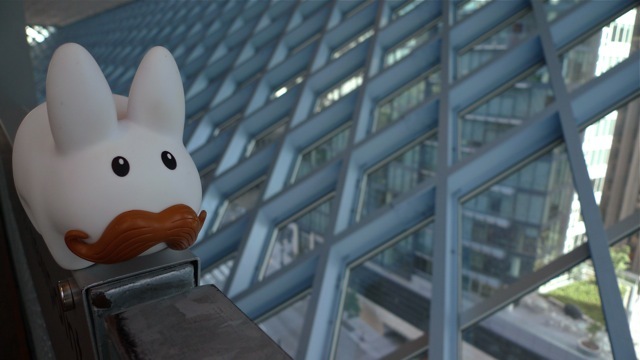 I've never been inside the downtown library, even with all the time I've spent in and around Seattle. Next trip! Awww, they would have loved to have gone to Molly Moo's ice cream, but they didn't make it. Next time...I hope there will be a next time!